Well, the initial contact with OWS in NYC is described in the article I wrote. I was also involved with Occupy Providence for a time: donating supplies, donating my kitchen at home for meals, raking leaves, lots of google group discussions, a GA, etc. Create News of the Movement on your own Websites and Blogs. See http://www.machiventa.org/phpB­B3/viewforum.php?f=37"
As far as foreign observations of the Occupy movement go, there is only one place you really NEED to occupy. That is K-Street, Washington. The world already knows the US Government is for hire, and K-Street is the recruitment agency. 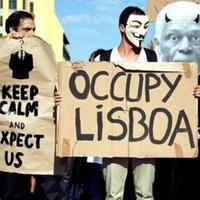 We are the campers at the Occupy Lisbon, we are the 99%! This has been an amazing experience. We've met, became the best of friends, and a lot of wonderful experiences we've shared. This is a statement co-authored with several faculty members at Brown. It was published in the campus newspaper on October 14, 2011. It circulated informally among various networks, doubtlessly missing many faculty members.